05-04-2019. This is such a big recruitment in the district of Vadodara in recent years. Eligible candidates can submit their online application through the official website of Vadodara Municipal Corporation @vmc.gov.in for this Public Health Worker and Field Health Worker Male jobs. For more information regarding this information please see the details furnished below for this VMC Recruitment of Public Health Worker and Field Worker. Vadodara is one of the fast growing cities in India and one of the cities which is having property of heritage Culture in Gujarat. Starting Date for Online Application Form Submission: 21-03-2019. Last Date for Online Application Form Submission: 05-04-2019. 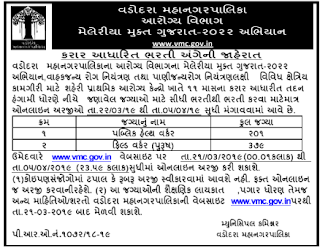 There are total 580 vacancies available in Vadodara Municipal Corporation 2016 Recruitment. For the post of Public Health Worker-12th pass and must have qualified Sanitary Inspector/ Multi Purpose Worker Course from a recognized Institute of Gujarat. For the post of Field Worker 8 class pass required and must have knowledge of cycling. For both the posts upper age limit is 30 years. Age relaxation is applicable as per Government norms of Gujarat. Selection for this Vadodara Municipal Corporation will be held based on personal interview only. Pls refer original notification for more information. Eligible criteria having candidates may submit the applications through the official website of VMC @ www.vmc.gov.in. After opening the link click on the Recruitment link a new page will open. Then select the post which you are going to apply and fill the all required fields and click on submit. Please share this VMC Recruitment of Public Health Worker and Field Worker vacancies information with your friend via the social net working sites and help them to achieve a better job. If you don’t need this jobs please share it some body may look for this kind of jobs. Click here to apply online for the VMC Recruitment of Public Health Worker and Field Worker..